First let's talk about what Sword's and Wizardry does well. It's a clean, easy to use and very clear product. I've only perused the PDFs, but the paper version looks like it's quite nice as well. The PDF is one of the clearest and more useful retro clones. It's an easier layout than Labyrinth Lord and well structured. The optional rule sidebars are great and the rules provide everything that a Basic/Expert Clone should, without much of the dross - like mediocre ship combat rules. It's just what you need to send two Fighters, a Wizard and a Cleric into a musty dungeon and have battle evil, or at least not very polite. 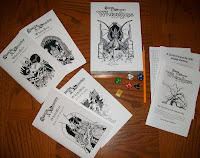 In Whitebox D&D there are only 8 classes of AC. Descending of course from 9 (unprotected) to 2 (Plate and Shield). This can easily be converted into ascending AC of 10 - 17 and that's not the point. 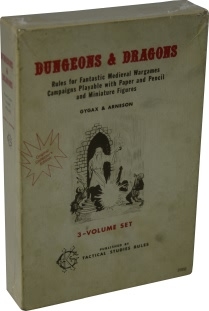 The point here is that things and people hit each other more often in OD&D than they do in newer editions. A 0-Level man at arms has a THACO of 19 while a 1st level PC has one of 18. This of course means that even a gang of peasants with shortbows has a 15% of hitting a fully armored knight in plate and shield with his AC of 2. Get several peasants, or goblins, and the best armored PC is in danger. Player AC actually gets comparatively worse with level, as something like a 5 HD ogre will have a THACO of 14, and need to roll above a 12 to hit the fully armored knight. Magic Armor doesn't even change this much as it penalizes the attacker's to hit roll (which might not really matter much - except it would arguably reduce 20's to 19's which will make a person in magic armor with a magic shield immune to attacks by normal men). The cool added effect here is breaking away from the AD&D weird overly specific armor system, so the GM has freedom to say a vest of rat skulls is light armor (AC 7) or heavy scale mail is heavy armor (AC 3) as the setting dictates. You have really light, medium and heavy armor. It's precisely the sort of thing players hate in Computer RPGs, but it works here because it increases player and GM choice and agency about armor by creating a simple and intuitive schema. 2. D6 Hit Dice and Damage. That's right in Whitebox D&D almost every attack does 1D6. A sword and a mace both do the same amount as an arrow or a skeleton's claws. To me this makes some sense, as whatever weapon one is getting smashed, stabbed or shot with, it's likely lethal if used by someone who knows what they're doing. That's not a game mechanic though, that's a justification. As a game mechanic this makes weapon choice a matter of flavor and perhaps GM adjudicated usefulness against various challenges. If 1D6 seems low, it's because HP are low to. Swords & Wizardy uses the rule that two handed weapons do 1D6+1 and small weapons 1D6-1. A good alternative to this is that Two Handed Weapons do 1D6 x 2, pick the best, damage. All Hit Dice are also D6, making a successful attack incredibly dangerous. HP gain is slowed as well for non-fighters. While Fighters have D6xLvl +1 Hit Points, other adventure types gain only D6x1/2 level HP (rounded up). These changes bring HP down across the board and by doing so make every strike count more. There are no attacks one can shrug off reliably in Whitebox as even a 3rd level fighter has 10HP on average, with a range of 4-22. Sure at 3rd level a fighter can reliably survive one hit, maybe even two, but taking on several enemies unsupported for more than a couple rounds is dangerous. Remember that AC is maxed out at 2 or 18, and so even lowly attackers will hit 3 in 20 times. Monsters suffer the same weakness, and while this makes something like a giant a bit less dangerous, it makes a pack of orcs with bows an incredible threat to a small party. Stats in Whitebox D&D and S&W Whitebox are almost without effect on character. The only bonuses are a +1 to hit with missile weapons for DEX of 13 + and +1 HP per level with a CON of 15 or above. The only Penalties are -1 to Hit with Missile Weapons for a Dex of 8 or lower and -1 HP per level for a CON of 6 or lower. S&W offers a standard bonus system as an alternative rule, but I think it detracts a bit from the game to follow it. This is a giant change. Of the changes here, it's perhaps the most important. An 18 Dex fighter is no longer untouchable. (with an AC of -2 or 22 in plate). It also makes Statistics less punishing for those that roll badly (3D6 in order is ideal) because they become more descriptive. Without the combat bonuses that make penalty stats character killers (a 6 DEX will kill a fighter when it gives a -2 to AC), a clumsy fighter or wizard is suddenly much more playable. Statistics still matter, because having a wider range of them makes statistic checks (roll under stat on a D20) more meaningful and so more useful. Stat checks can become a basic means of determining character skill when necessary (climbing a slippery rope say) without resorting to additional modifiers and having really equal chances of success amongst party members. This of course encourages PC variation and through it role play. With low HP and flat attacks, a single hit has a good chance of killing most PCs and most monsters. PCs aren't extraordinary killing machines with large bonuses to hit and damage (+3 to hit is a 15% bonus!) either. Everything is a killing machine, combat is deadly. One hit will finish off most things or PCs and it rarely takes more than several. yet because the D6 is used rather than the D8 combat is less unpredictable as the total amount of everything is lower. 1HP of damage means 30% more (sort of - not literally). This encourages a different style of play than even in Basic Expert or its retro-clones. Combat suddenly becomes incredibly important to avoid, but being ultimately unavoidable in an FRPG, incredibly important to control. Players can't expect to easily survive any combat, but know that if they can get off the first round of attacks, they'll likely damage or destroy the enemy. Backstab attacks become far more lethal, but thieves in melee have almost no chance of survival. One use magic items, potions and spell scrolls all seem far more worthwhile using as every combat is incredibly dangerous and even slight bonuses (+1 to hit say) are very effective. Using these rules it suddenly makes sense why bless might be as useful a spell as cure light wounds (-1 to hit for enemies/+1 hit for friends is a much bigger deal with Whitebox Rules). Another aspect of play this system promotes is the use of henchmen, lots of henchmen. A squad of five archers makes a PC much more dangerous, because these 0-level hirelings will often be able to hit even powerful enemies. Henchmen also provide much needed extra bodies to absorb damage. At higher levels henchmen become even more important because even a well executed surprise attack will have less of a chance of killing a high HD monster, and the increased ability to hit makes those monsters much more dangerous. As such it's important to watch henchman morale and numbers in a OD&D game, but I personally like the feeling of a character building a group of retainers, and Charisma becoming a more important statistic. In addition to making combat incredibly tense, these rules make it fast, which is another way to de-emphasize combat, or at least its mechanical aspects. Combat becomes about seeking positional or situational advantage not about crunching numbers, and because the mechanics are transparent there's more room to provide bonuses and penalties based on situational decisions. Furthermore with quick deadly combat, Whitebox play works extremely well with wither GP as XP treasure based advancement or mission base XP. Again I want to emphasize these small changes to or existing rules within S&W, and to suggest why I find the simplified play exhilarating and why these old rules create a very specific flavor of game that isn't as easily found in later (even Basic/Expert) play. Minor correction: two dice, take highest for two-handed weapons is a house rule I took from Philotomy. Yeah I realized that I had been comparing S&W core with OD&D Whitebox, I made some changes above to reflect how close to the original S&W core is. Also just about everything above is occasioned by your interpretation and use of the LBB rules. Your last point is an important one to me. I have noted that many, many Old-School players do not hire henchmen; ment-at-arms, etc. were never part of their game. I've never understood that. While one always encounters that player who buys a wardog at character creation, the power of numbers in the game cannot be overstated. All new PCs in my games start with a retainer for free. Making this a default really helps communicate the value. One thing I forgot to mention is that henchmen are also your next PC in LBB games - and you'll need them. Good post! Interesting stuff. I was unaware of the AC limits.